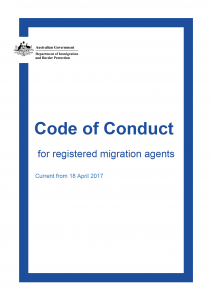 The Code of Conduct for migration agents is authorised by the requirements of the Migration Agents Regulations 1998 No. 53, Schedule 2, Regulation 8 and the Migration Act 1958 Subsection 314(1). Read More (this will open a new window with a PDF).